Marion F. "Bud" Scranton, 93, of Quincy, formerly of Payson, passed away at 2:25 pm Saturday (September 15, 2018) in Good Samaritan Home. Born July 14, 1925 in Quincy, Bud was the son of Frank and Myrtle Mann Scranton. He married Mary Junkerman in the First United Congregational Church in Quincy on April 2, 1949. She preceded him in death on March 3, 2016. Bud was a lifelong farmer and also worked for Adams F.S. until his retirement in 1993. 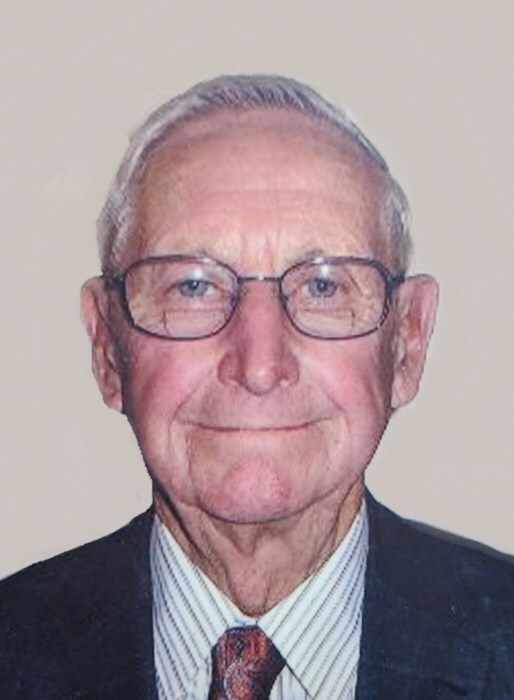 He was a 1943 graduate of Seymour High School in Payson, and a lifelong member of the Payson Congregational Church, serving as Sunday School superintendent for over 40 years and as Deacon and trustee for many terms. He and Mary were also Charter members of the Couples Club at the church which was started in 1950. Bud was the leader and softball coach of the Payson Rolling Ridge 4 H Club for 37 years and could always be seen helping the young people with their livestock at the Adams County Fair. Bud and Mary were members of the Payson Athletic Club and supported the sports at Seymour High. In 1990, he and his wife received Athletic Club Awards and a Scholarship established in their honor for a Senior Athlete with Academic Achievement at Seymour High School each year. He was an official scorer for the State Class A Basketball Tournament for 1 year and served as Basketball scorer for the Seymour Indians for 42 years. He was inducted into the Illinois High School Association Hall of Fame as a Friend of Basketball in 1990. In 2000 he was honored by the Payson Seymour High School for his 42 years of dedication to the basketball program and was inducted into the Payson Seymour High School Hall of Fame in 2011. He was honored by having the annual JV Basketball Tournament named after him. In 2018 he was honored by the Payson Seymour High School Booster Club for being the number 1 fan. Bud was a member of the Payson Old Settlers Association, helping wherever needed. He will be remembered as Payson's die hard Cubs Fan, never giving up on his team like the Payson Cardinals Fans who were only Cardinal fans when they were winning. Bud lived to see his Cubs win the 2016 World Series. He received the Plainville Lions Award in 1980, the Payson Masonic Lodge No. 379 Community Builders Award in 1992, and the same award from the Plainville Masonic Lodge in 1993. In 1991 he and Mary were the Grand Marshalls for the Old Settlers Parade. In 1993 they were featured by WGEM TV for services given during the 1993 flood with the Adams County Red Cross. Survivors include three children, Keith Scranton (Kim) of Quincy, Dr. Karen Winters (Carl) of St. Louis, MO and Kay Neisen (Kevin) of Bloomington, IL; six grandchildren, Erica Scranton, Kyle Scranton (Elyse), Derek Winters (Meredith), Erin Mitchener (Brandon), Kelsey Fry (Jimmy) and Kara Roach (Jimmy); three step grandchildren, Matt, Brett and Keri; three great grandchildren, Maxwell Winters, Kaiden Scranton and Sasha Winters and seven step great grandchildren. Bud was preceded in death by his parents; his wife Mary; two brothers, Harry Scranton and his wife Virginia and Amos Scranton and his wife Rosina; one sister, Rose Fruit and her husband Lionel; a granddaughter, Bryn C. Winters and many nieces and nephews. Funeral services will be held Thursday morning at 10:30 in the Payson Congregational Church with Pastor Steve Disseler officiating. Burial will be in the Payson New Cemetery. Visitation will be held Wednesday evening from 3:00 until 7:00 in the Zehender Robinson Stormer Cookson Funeral Home in Quincy. Memorials may be made to the Payson Seymour Athletics or the Payson Congregational Church.